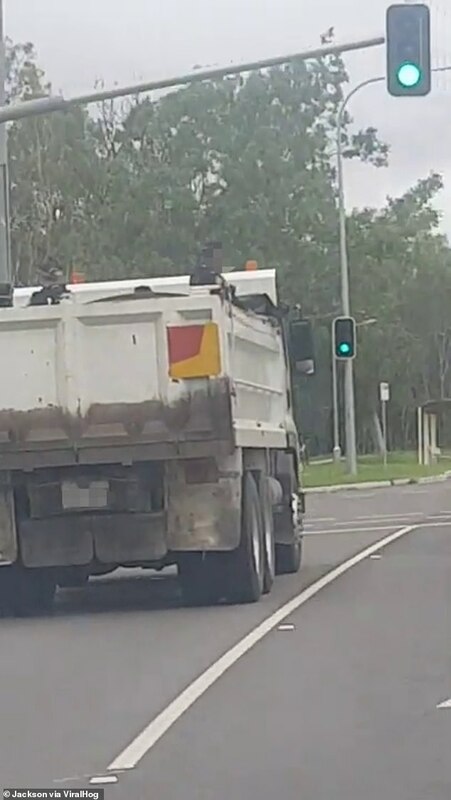 Two Queensland police officers have been filmed riding on the back of a council truck driving down a highway at 60km/h. The footage shows two cops in the back of large truck on a Townsville highway heading towards Ross River Dam. The video was shot from a car as it passed the large truck, and the car’s occupants can be heard questioning the legality of the unorthodox ride. ‘Don’t know how the f*** this is legal,’ said one of the passengers. The police officers involved look unperturbed by their means of transport, and one of the officers simply stares at the camera as the car drives past. Contrary to what the witnesses may have thought, the two officers – who were responding to the devastating floods in northern Queensland – were well within their rights. A spokesman for Queensland Police said the truck had been commandeered under two different disaster acts declared in response to the situation in Townsville. ‘Under these circumstances police officers may take control of any resource necessary for the purpose of protecting the safety and lives of the public,’ the spokesperson said.